12.10.2014. In the near future, a website similar to an international tourist web portal booking.com will appear in Georgia, which will give visitors the opportunity to book accommodation before arrival in the country. 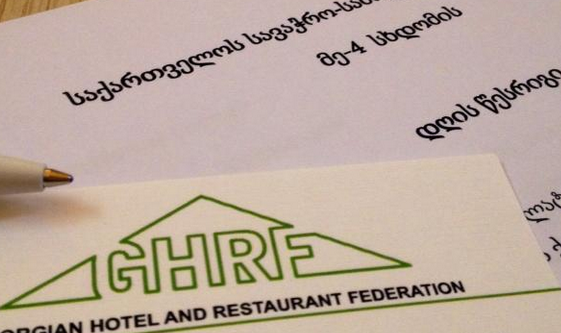 This initiative belongs to the recently established Georgian Hotel and Restaurant Federation. Experts welcome the establishment of such an association and believe that it should play the role of mediator between the government and the tourist industry. According to them, in order tourism business to develop successfully, it is necessary to streamline the tax system and labor laws. "The government should look at private business as a partner and not an enemy or a cash cow. The Hotel and Restaurants should actively work in this direction, "- experts say. According to the Federation, its function is to be a bridge between the government and the tourist industry - in particular, in their opinion, a classification of hotels and equal attention is required to large branded hotels as well as to small home-like hotels and hostels. One of the founders of the Association Shalva Alaverdashvili says that there is a need to improve the quality of services in the tourism sector. "The situation on the market shows that certain frames should be introduced for hotels and restaurants. Currently, the group of experts is working on minimum standards which will be mandatory - for example,the creation of an environment for people with disabilities, the availability of emergency exits, etc. We also intend to conduct special training for staff retraining on international grants in order owners of small hotels not to spend money on this,"- he notes. Currently, the Georgian Restaurant and Hotel Federation includes up to 70 hotels and restaurants.